It’s easy to default to downtown when it comes to deciding where to dine, but if you head north past 16th Avenue on Centre Street, you’ll find Scopa, one of Calgary’s newest restaurants, nestled up next to Lina’s Italian Market. The interior of Scopa is warm and inviting, just as a neighbourhood Italian restaurant should be. With “Neighbourhood Italian” as its mantra, Scopa definitely succeeds in embodying that neighbourhood restaurant feel while maintaining a standard of food that we’ve all come to expect from its sister restaurants Cibo, Posto and Bonterra. The room is decorated with deep reds, yellows, a long red-and-white striped banquet and a wall panelled with recycled wood with big, bright letters spelling out “Scopa.” It’s a room that is ideal for almost any occasion, from grabbing a bite solo at the bar to having dinner with little ones or big groups of friends. 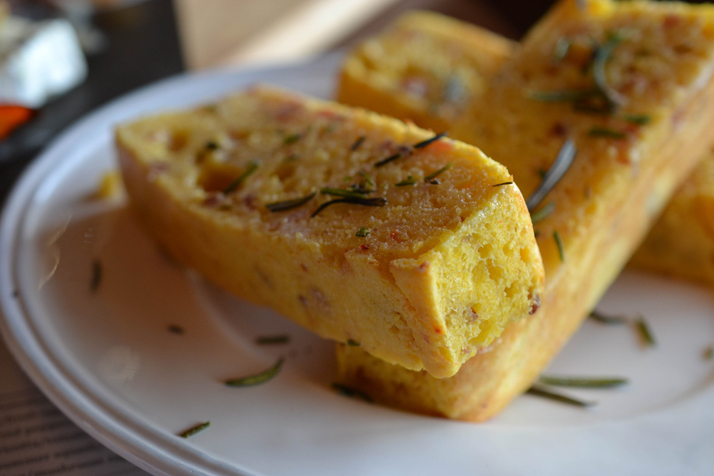 Polenta bread with pancetta, rosemary and honey butter. Get the dinner ball rolling here in true Italian style with a smattering of cured meats like the beef bresaola (thinly sliced air-dried beef) made in-house and an array of pickled and roasted vegetables with a side order of Scopa’s polenta bread. Essentially a corn bread filled with chunks of pancetta, topped with rosemary and honey butter, it’s a must order here and more than slightly addicting. As more varities of local tomatoes ripen with every passing August day, it’s a no-brainer to order a Caprese salad for the table. Sweet slices of tomato topped with tender chunks of White Gold fior de latte, balsamic and basil? You can’t ask for something more fresh-tasting at this time of year. The saffron-infused arancini on sweet marinara sauce is also a no-fail starter, so make sure you’ve shown up here with a big appetite. 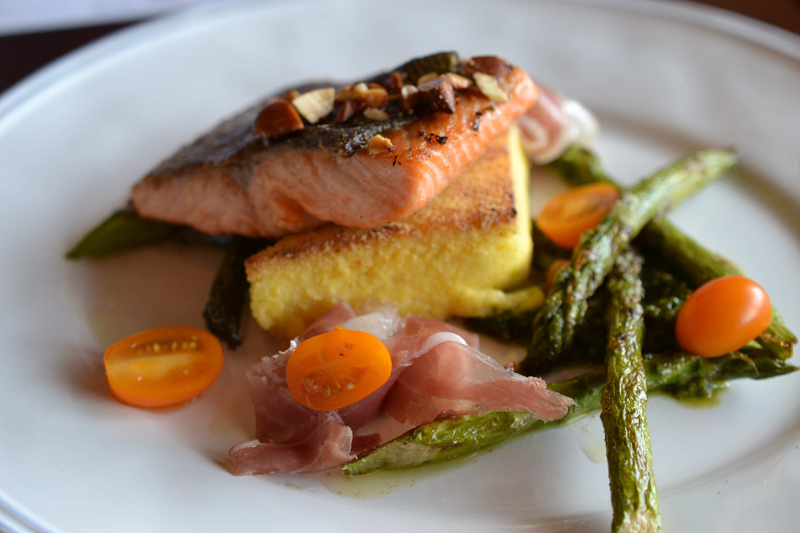 Steelhead trout with almond pesto, polenta and asparagus. Now, pasta may not be your first choice when you’re dining mid-summer, but the spaghetti a la carbonara here made with white wine, chilis, grana padano and big, crispy chunks of wild boar bacon is an all-season dish that will hit the spot (psst … you’ll find it on the menu at Bonterra too). When it comes to wood-fired pizzas, the options stay simple here with either margherita, meat or mushroom, making room on the menu for a nice variety of rotisserie dishes (beef, chicken and pork shoulder) or a nicely seared steelhead trout with almond pesto, polenta and asparagus. The restaurant’s dessert menu doesn’t venture too far out of the box, but when you’re working with classics like tiramisu, cannoli and panna cotta, why even try to mess with a good thing? Admittedly, one thing that Scopa does lack in comparison to it’s Italian restaurant family in the Beltline is a patio worthy of outdoor dining. Not to fret, design plans are in the works to have a front patio constructed and ready to roll come Spring, 2015.